Composers, improvisers, performers, sound installation artists, the NIME 06 concert guests are also digital technology researchers and experimenters. Pushing the boundaries between the premeditated and the composed, between what is played and what is perceived; interaction is the basis of these artists' credo. 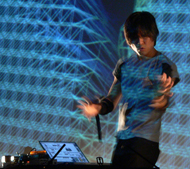 An IRCAM-NIME 06 co-production with the support of the Live Algorithms for Music Network (LAM), the Studio for Electro-Instrumental Music (Steim) and Yamaha.